The Bridge Club is a fellowship ministry for peoples of all ages and faiths. We have a great turnout each week between 24-40 players. 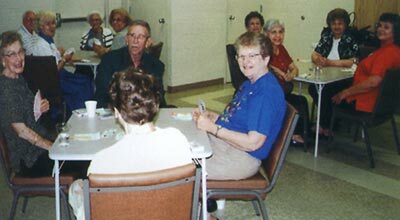 Bridge games take place in rooms CC1 and CC2, on Thursdays from 1:00 p.m. to 4:00 p.m. Parking is available on the north side of the St. Pius X Youth Center on Lum Street. Click here for directions to CC1 and CC2. The cost is $1.00 for 3 hours of entertainment and the donation goes towards prizes, refreshments, supplies and the St. Pius X parish projects. If interested in joining the Bridge Club, just show up on a Thursday.